All I can say is YUM! 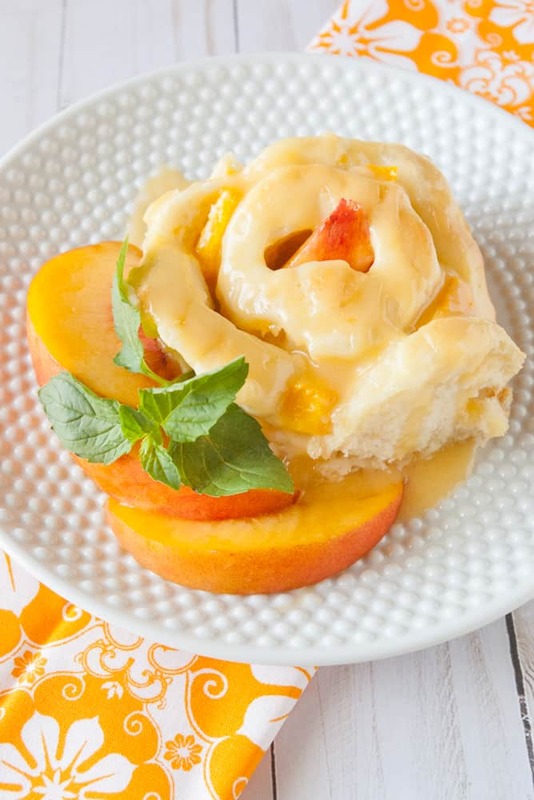 These peaches and cream sweet rolls are absolutely delicious! 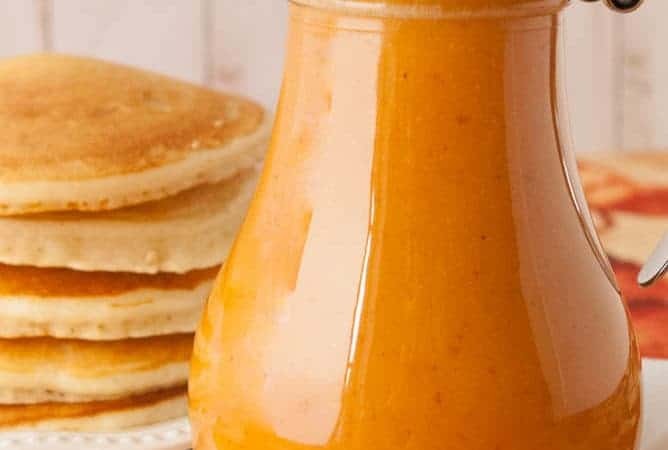 It’s like eating peach pie for breakfast! Check these peaches and cream sweet rolls out!!! Even I was surprised how amazing these tasted! They were just the right amount of gooey and tasted like fresh peach pie! I will definitely be making these again and again! Prepare the dough according to the recipe instructions. FYI…this dough does take a little longer because it is a batter dough opposed to a regular bread dough. Prepare the cream cheese filling and the peaches during the second rise time. Roll out the dough into a rectangular shape. The dough should be a little more than a 1/2 inch thick. 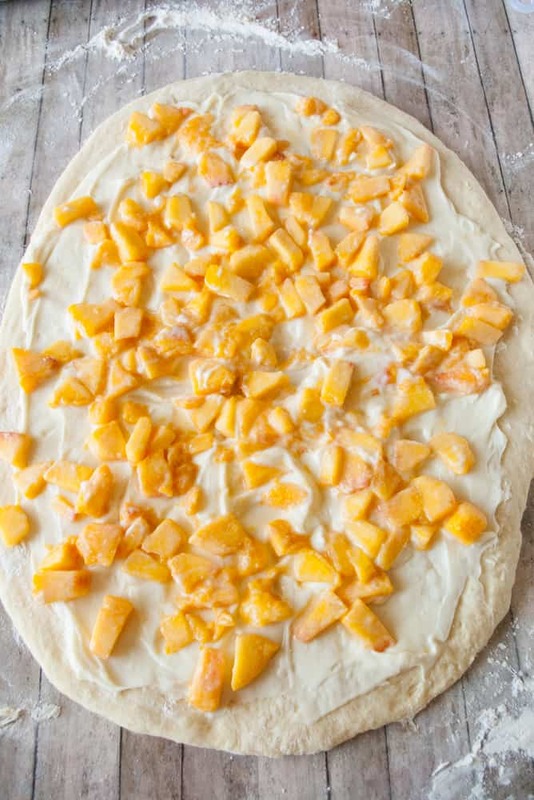 Spread the cream cheese filling over the rolled out dough and evenly distribute the peaches on top of it. Roll up jelly roll style and cut into 1 1/2 inch slices. These sweet rolls are a little messy. Just the nature of the beast. Place the slices in a prepared 9×13 dish and cover and let them rise until nearly doubled. Bake in a preheated oven for 25-35 minutes. Cool these peach sweet rolls for 10 minutes before drizzling with the peach glaze. Serve warm or cool completely before serving. Store in the fridge. 2 Cups Fresh Peaches peeled, sliced and diced. In the bowl of a stand mixer fitted with the paddle attachment (you can make these with hand beaters, too) place the 1/4 cup of butter, 1 tsp Salt, and 1/4 cup of sugar. In a small saucepan, scald the 1 cup of milk. To scald milk, heat the milk over medium heat high to nearly boiling. Remove from the heat and pour over the contents of the mixing bowl. Allow to cool to a warm, but not hot temperature (a little warmer than a baby’s bath water). This takes 20-30 minutes. In a small bowl, dissolve the yeast and 1/2 tsp sugar in 1/3 cup warm water. Let stand until foamy. About 5 minutes. Pour the foamy yeast, 2 eggs, and 2 cups of the flour into the mixing bowl. Mix on low just until everything is mixed together. Then beat on medium high for 5 minutes. Don’t skimp on the time. You must beat it for 5 minutes. Add the remaining 1 1/2 cups flour. Mix until incorporated. This is a batter dough so the dough is going to be sticky and gooey, it will not be a ball of dough. Cover the dough and let rise until doubled. This will take an hour to an hour and a half. Punch down the dough, recover, and let rise a second time until doubled. This will only time 1/2 the time of the first rise. While the dough is finished rising for a second time, spray a 9×13 baking dish with non-stick cooking spray and mix up the cream cheese filling by beating all the cream cheese filling ingredients together until smooth. Peel, slice and dice enough peaches to measure 2 cups of peach pieces. Dump them in a ziploc bag with the cornstarch and shake well. 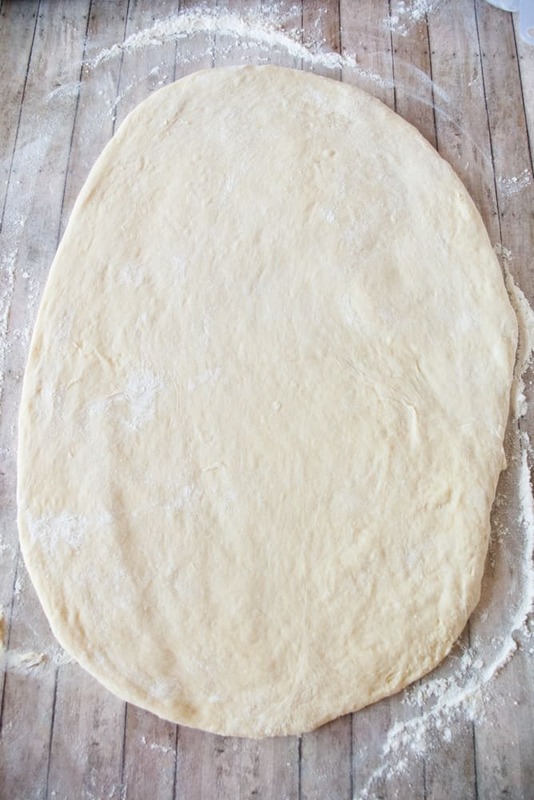 Dump the risen dough out onto a generously floured surface. Knead gently just enough so the dough is not sticky. This won’t take a lot of flour. Remember this is a soft dough and should not be a stiff ball of dough like bread dough would be. Roll out into a rectangle that is roughly 20×14 inches. Spread the cream cheese filling over the top of the rolled out dough. 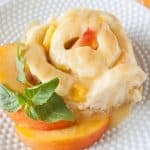 Evenly distribute the peach pieces over the cream cheese filling. Roll up jelly roll style and slice into 12 one and a half inch thick slices. And, yes, this is a bit messy. Place the slices in a 9×13 baking dish that has been sprayed with non-stick cooking spray. Cover and let rise until nearly doubled and while your oven preheats to 350 degrees. 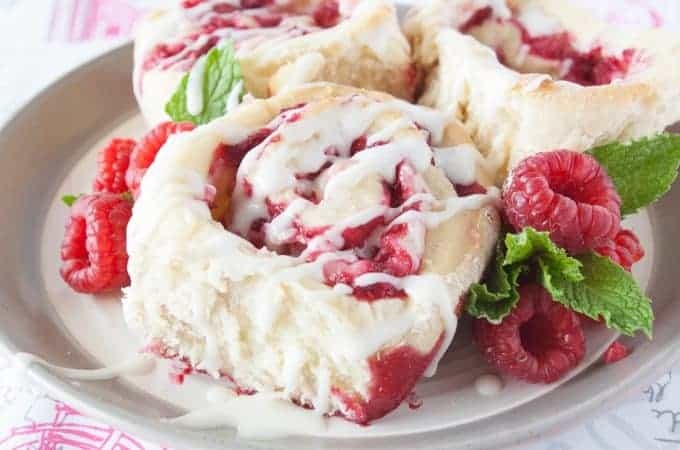 Bake your sweet rolls in the preheated oven to 25-35 minutes. While they are baking, puree roughly 1/2 a peach giving you about 1/2 cup of peach puree. Beat in the powdered sugar until it is smooth and makes a pretty peach glaze. Cool the sweet rolls for 10 minutes before glazing. Serve warm or cool before serving. Store in the fridge. I used 3 big peaches for this recipe. Have you tried this recipe? If so, leave me a rating above and a comment below! Other recipes I know you’ll love! Don’t forget to subscribe to get my newest recipes sent right to your email! 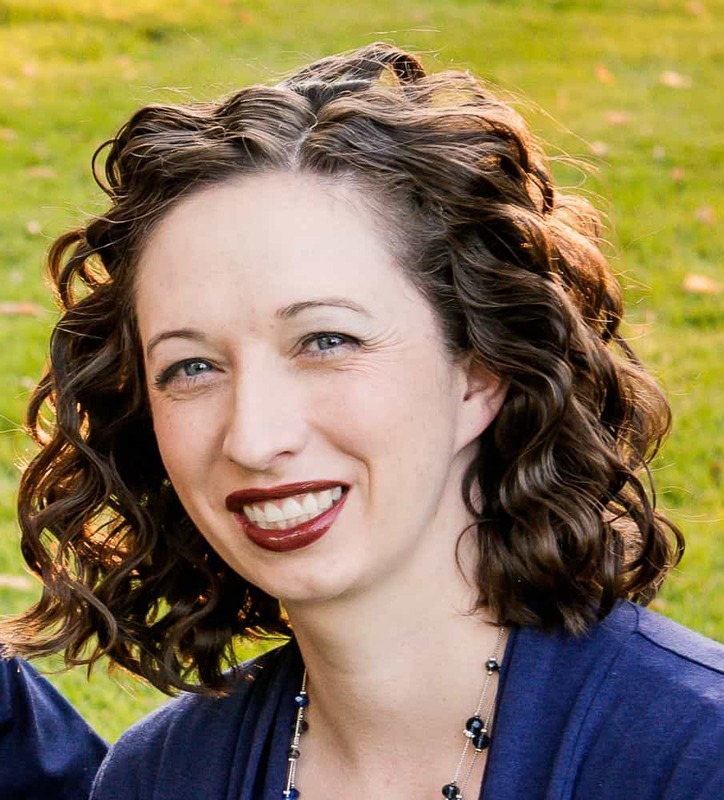 You can also follow me on Facebook, Pinterest and Instagram! ANY NUTRITIONAL ANALYSIS ON THIS SITE IS BASED ON AN ESTIMATE, CALCULATED BY NURTIFOX PLUGIN (OR OTHER THIRD-PARTY SOURCE) FROM THE INDIVIDUAL INGREDIENTS IN EACH RECIPE. VARIATIONS MAY OCCUR FOR VARIOUS REASONS, INCLUDING PRODUCT AVAILABILITY AND FOOD PREPARATION. WE MAKE NO REPRESENTATION OR WARRANTY OF THE ACCURACY OF THIS INFORMATION.